Zucchinis are everywhere. Have you noticed? If you have a garden, you know what I’m talking about, and if you don’t have a garden you know what I’m talking about too because, chances are your neighbor has a garden and they are giving you their extra zucchinis. We don’t have a vegetable garden here at the Dusty Dog – not that we haven’t tried. Our first summer, we installed a tiny raised bed in the front leach field and planted tomato and pepper plants. Little did we know that growing vegetables is not really an option at 7900 feet unless there’s a greenhouse involved. This year, I tried cold weather crops in a huge pot – swiss chard, lettuce, and some herbs – they would have been hugely successful if it weren’t for the rabbits. The only thing thriving in that oversized pot is two thyme plants. I guess the rabbits don’t care for thyme. Obviously, I don’t have any zucchinis of my own, and neither do my neighbors. But, the Taos Farmer’s Market vendors are laden with them. Here in New Mexico, most farmers have what they call calabacitas, which are small, round, light green squash. Calabacita is actually the Spanish word for little zucchini, and it isn’t clear from my internet search whether calabacita is an actual type of squash or not. 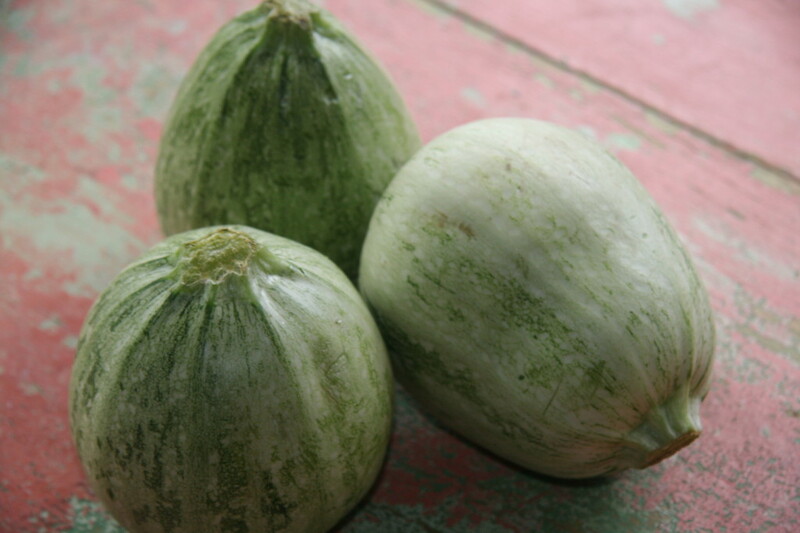 Yesterday, when I was at Whole Foods Market in Santa Fe, they were selling the small, round squash like the ones pictured above, and they called them calabacita squash. Maybe they really are an actual type of zucchini, but I’m still not certain. Calabacitas also refers to a New Mexican dish, usually made with zucchinis, peppers, onions, and chiles. Every week, I buy several calabacitas and use them to make succotash and grilled zucchini. 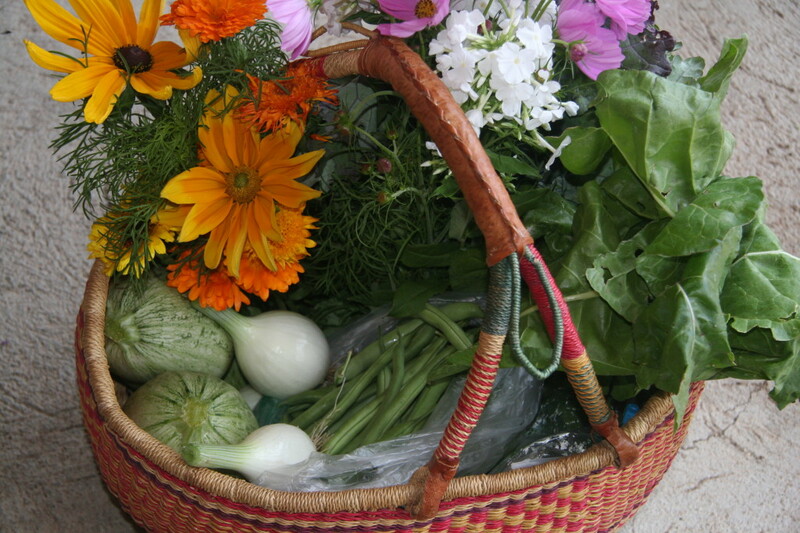 Here’s one of my Farmer’s Market baskets full of last week’s harvest. Recently, two of my friends from my Dallas writing group came to visit me at the Dusty Dog. One of the friends went to Santa Fe for the day and came home bearing the most wonderful gift for me – black onyx cocoa powder from a new store called Savory Spice Shop. The gift came complete with a tiny recipe card for zucchini cake. It happened to be Farmer’s Market day, and I bought calabacitas and made muffins instead of cake for a small dinner party at a neighbors. Since then, I’ve experimented with recreating this recipe to spruce it up a bit adding more cocoa powder, yogurt instead of water, and coconut. My latest version of these muffins turn out so moist and delicious that it’s hard to stop eating them. And they’re healthy too with a big dose of vegetables in every dark, rich, chocolatey bite. I know you’re going to love having a new recipe for all those zucchinis lining your kitchen counter. Better get out the mixing bowls – it’s time to start baking. Preheat oven to 350° and place cupcake papers into the slots of three cupcake pans or grease and flour three cupcake pans. Combine all dry ingredients in a mixing bowl and whisk to remove any lumps. 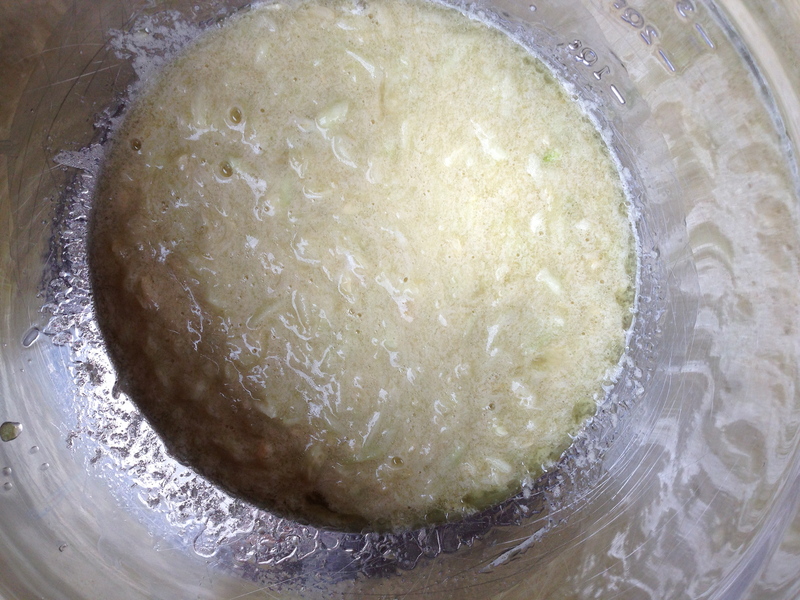 In a separate mixing bowl combine the grated zucchini, yogurt, vanilla extract, oil, eggs, and coconut. 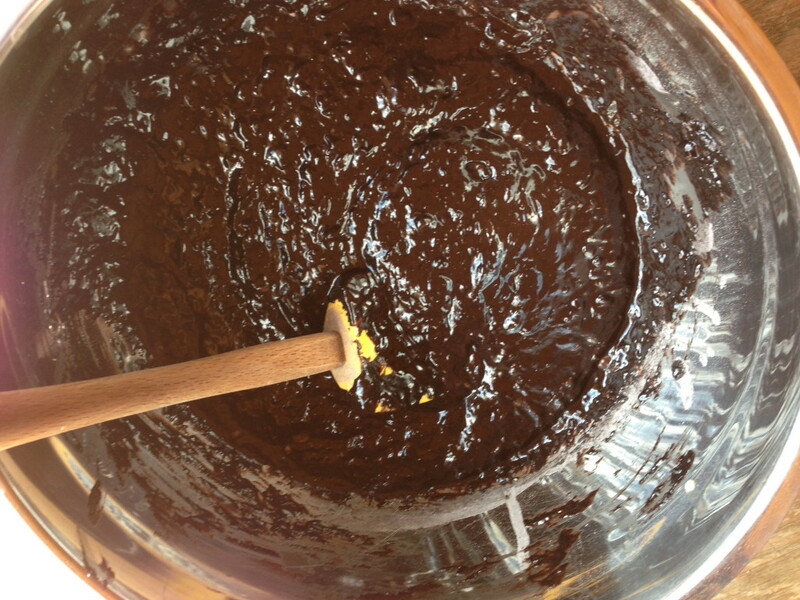 Combine the dry and wet ingredients mixing until moist. 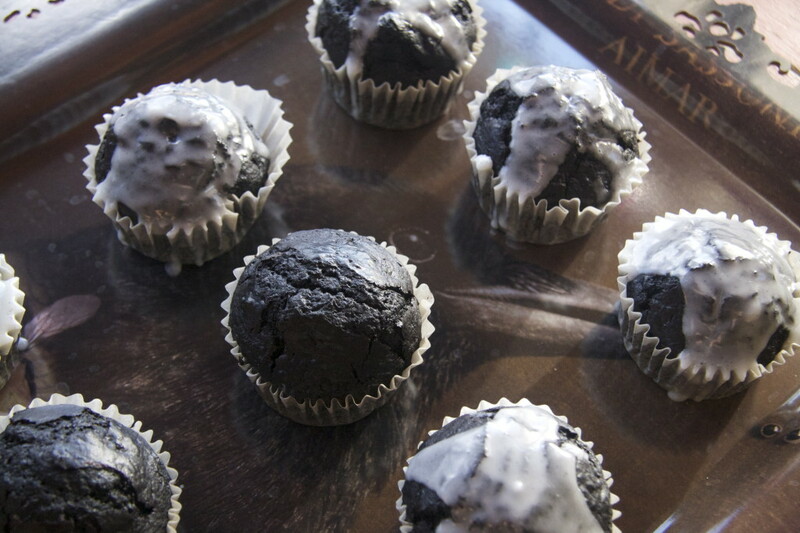 Pour into cupcake papers and bake for 20 to 25 minutes or until a toothpick inserted in the center comes out clean. To cool and glaze, place the muffins on a wire rack set inside a cookie sheet. Once the muffins are cool, begin making the glaze. 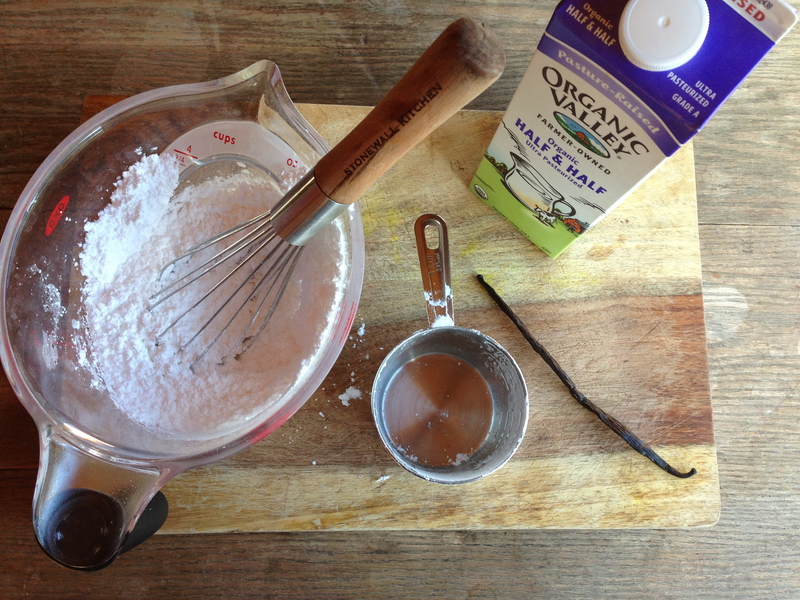 I use a large measuring cup with a pour spout to make the glaze, so it is easier to pour the glaze onto the muffins. 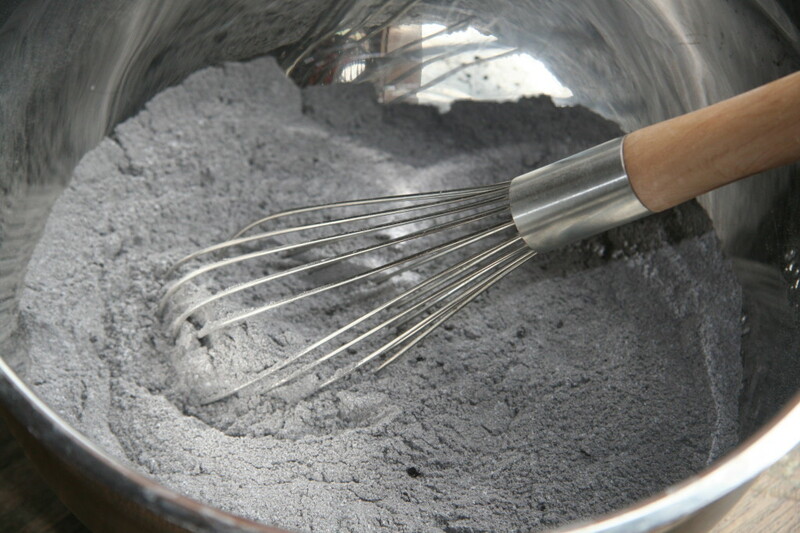 Sift the confectioners sugar to remove any lumps or if you don’t have a sifter, which I just discovered I don’t have at the Dusty Dog, then whisk the confectioners sugar with a whisk or fork to remove any lumps. 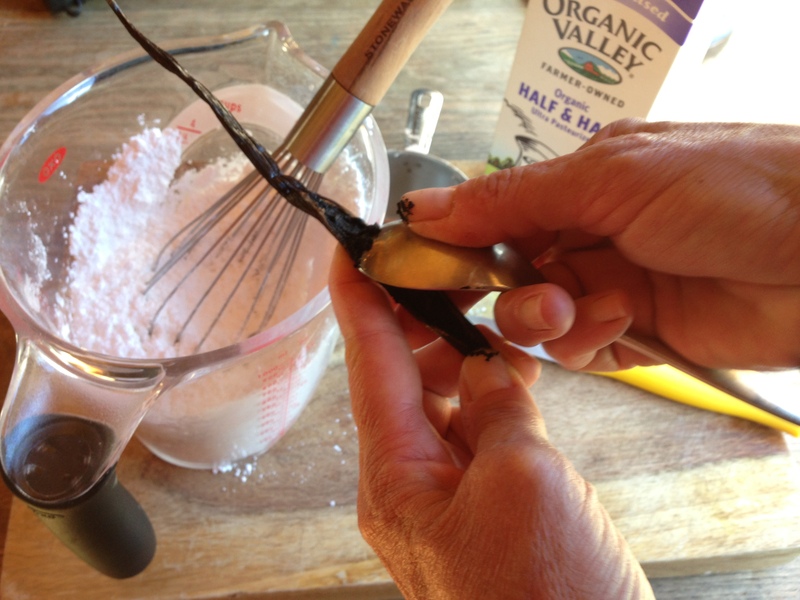 Slice open the vanilla bean using a knife, and using a spoon, scrape the seeds from the inside of the bean. Add the milk and vanilla then whisk until smooth with no lumps. This is a glaze, not an icing, so it will be more fluid. If you make it too thick, it will look like this. Pour the glaze over the cupcakes allowing it to run down the sides and coat the top. 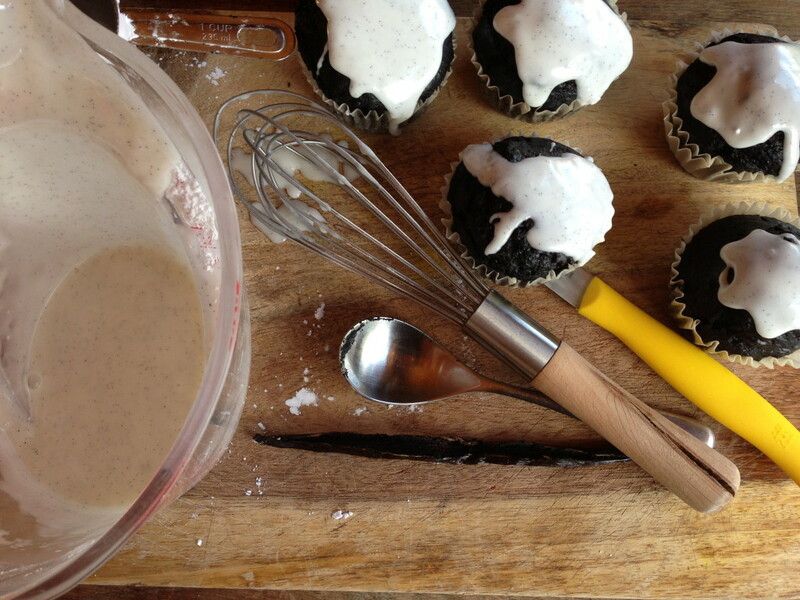 Let the glaze harden before transferring the cupcakes to a serving platter. 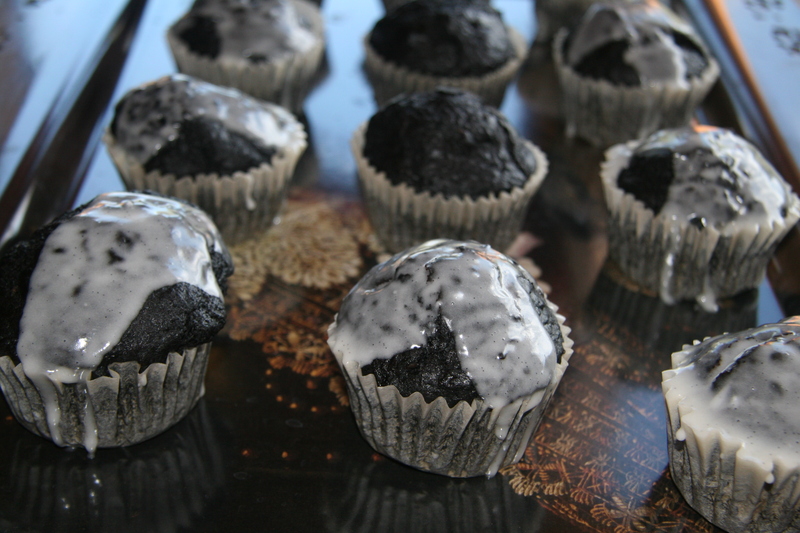 These muffins are also great without any glaze. Enjoy! 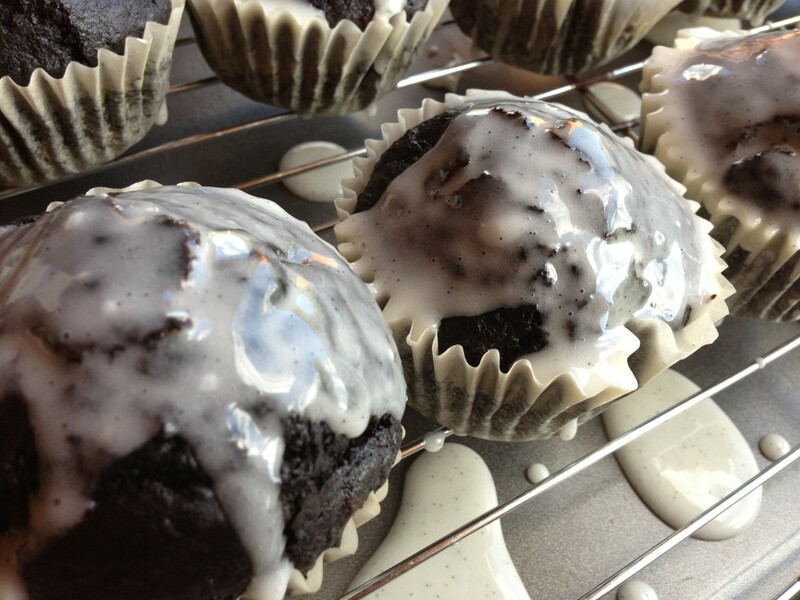 This entry was posted in Dessert, Muffins, Quick & Easy, Recipes, Uncategorized and tagged Cake, Coconut, Dark Chocolate, Dessert, Easy & Quick, Entertaining, Muffins, Zucchini. Bookmark the permalink. What a great idea for cooking and eating zuchini. I am going to love eating this muffin. 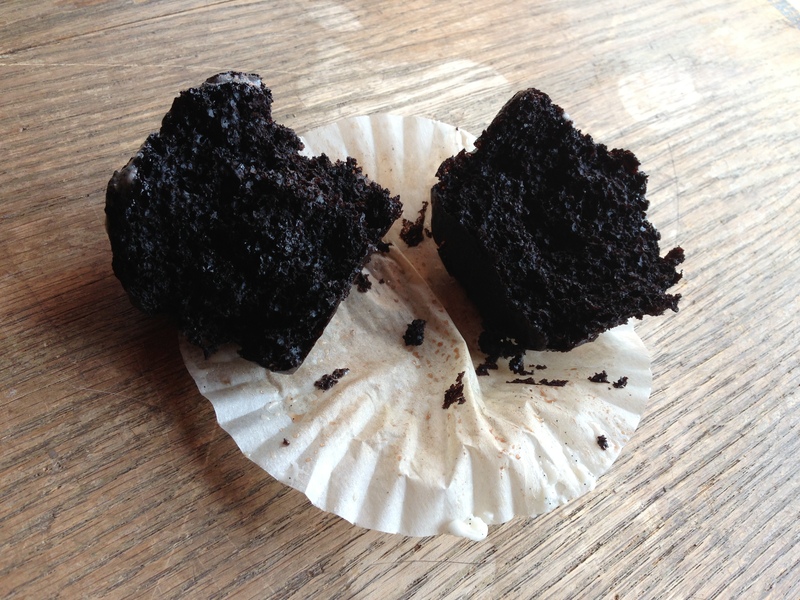 I love vegetables and to have my zuchini in a chocolate muffin is such a great thought! You will love them Faye – they are delicious and nutritious!